If you've read my Black Toro, or Bowery to Williamsburg review, then you will know that peanut butter and I have a special relationship. Not only because of it's health benefits (in small amounts of course) but also because its versatility and fantastic taste. Most recently, I've taken a liking to oats. In true form, I've taken bits and pieces of my favourite flavours and thrown them together to form a melting pot of wholesome, nutrional deliciousness (if I do say so myself). This breakfast dish is so easy and so clean, you will wonder why you hadn't thought of it yourself. The method is pretty self-explanatory. But if for some reason you've never cooked oats over a stove before in your life, it's pretty simple. I place the oats into a sauce pan first, then pour in as much milk as I like (usually just enough cover the bottom of the pan), and add the banana (sliced up into smaller pieces so it cooks quicker), and leave it to cook over a high heat. Sometimes I'll add some sultanas or a cut-up dried fig to make it sweeter, but you don't have to do this. At some point during the cooking process, I'll add a tablespoon of peanut butter and stir it all together until the oats have cooked and softened and are ready for consumption. 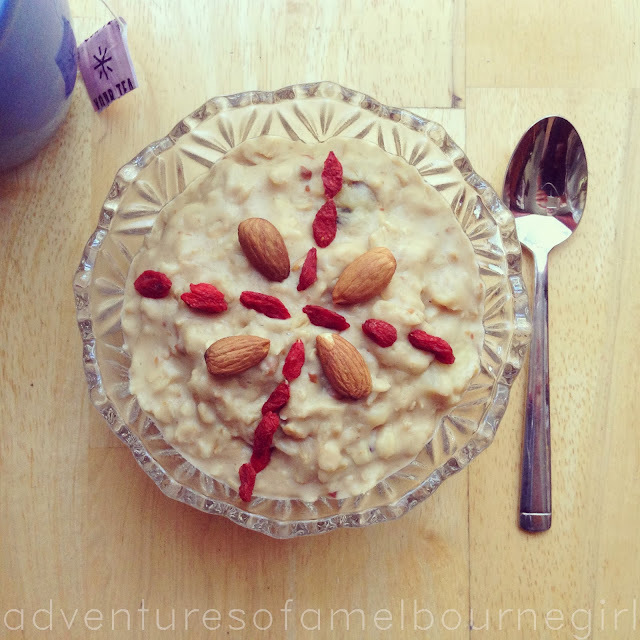 After placing the oat mixture into a bowl, I'll usually spend some time dressing it up with either goji berries or nuts, just because I like to play with my food. And that's it. It can't get any simpler.